Model Name: Submariner "Four Liner"
Accessories: Accompanied by Rolex chronometer certificate dated January 21, 1965 and presentation box. Launched in 1959, reference 5512 is today one of the most sought-after Submariner references on the market. Extremely rugged, it differed from its predecessors reference 5508 or 6536/1 as the model was fitted with crown guards. The case was slightly enlarged from earlier models and gave a bigger presence on the wrist. 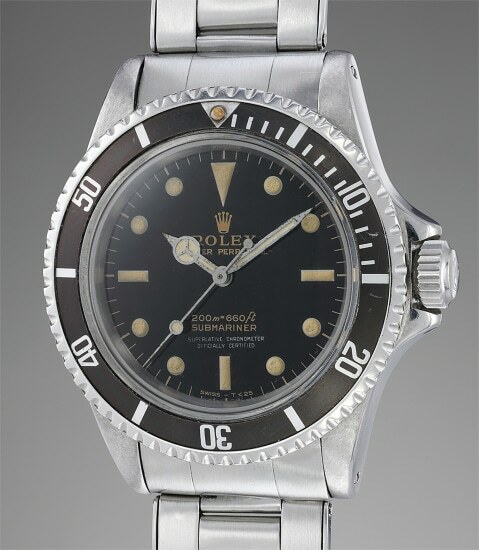 While the earliest examples featured square crown guards, later generation models, such as the present watch displayed rounded crown guards. Compared to its sibling reference 5513, reference 5512s were fitted with chronometer movements. The present watch is a beautifully preserved specimen. It is distinguished by its original condition. Displaying full proportions, it still retains bevels on the case. The present watch displays a well-preserved lacquer dial that bears "Superlative Chronometer Officially Certified " - these examples are known as "four liners" and are particularly sought-after by collectors. Most impressively, it is offered with its original chronometer certificate and presentation box, adding another layer of desirability. Furthermore, the bracelet is stamped for 1965 and corresponds with the year of manufacture.